You might think, because of rising interest rates, that it no longer makes sense to refinance your home mortgage. Or maybe you are certain you don't have enough equity in your home. Perhaps you don't think you have enough available cash to afford a refinance, so what is the point of trying? 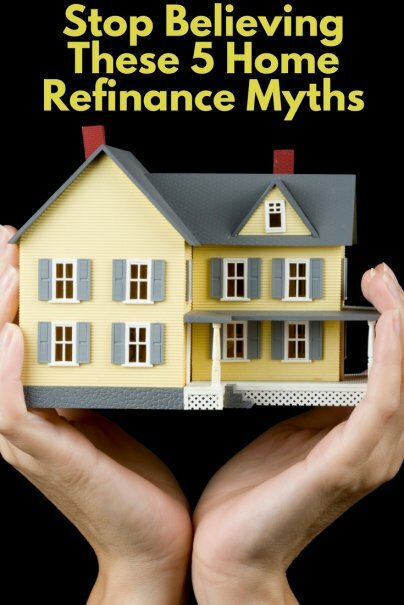 Here's the truth: Those are all refinancing myths. Don't let these common falsehoods stop you from trying to refinance your existing mortgage into one with a lower interest rate or a shorter term. Refinancing can boost your financial health, either by lowering your monthly payment or reducing the amount of interest you'll pay during the life of your loan. Traditionally, mortgage lenders have required that homeowners have at least 20 percent equity in their residences before refinancing. It might not be easy to hit that mark if your home has lost value since you purchased it. But the 20 percent rule isn't quite as absolute as it once was. The federal government's Home Affordable Refinance Program, better known as HARP, allows homeowners to refinance even if they have no equity or negative equity in their homes. You will have to meet certain requirements, but if you are low on equity, HARP can help. To participate in HARP, ask the lender that is handling your refinance. This lender will help you determine if you qualify for the program. No one disputes that refinancing is expensive. Lenders vary, but you can expect to pay about 1.5 percent of your loan's outstanding value in closing costs. If you are refinancing a loan with a balance of $200,000, you'll pay about $3,000 in fees. Don't panic, though: Most lenders will allow you to roll these fees into the balance of your new loan. This means you won't have to pay them upfront when you close on your refinance. Instead, they'll be paid out over time, every time you make a monthly payment on your new mortgage. Of course, if you can afford the costs of refinancing, you can also pay the closing fees upfront in one lump sum. Maybe you tried refinancing a year ago, but your lender rejected your application. This doesn't mean that you can't ever qualify. The reason for your rejection is key. You are free to refinance with any mortgage lender that is licensed to do business in your community. This means that you don't have to close your refinance with the lender to which you are already sending your monthly payments. You might think it's easier to work with your existing lender, but this isn't really true. You'll still have to send paperwork to your current lender verifying your job status, salary, and yearly income. This information, after all, might have changed since you first took out your mortgage. Your current lender will want to verify that your income is still high enough to afford your new monthly mortgage payments. Also, it makes sense to get quotes from several lenders when refinancing. You might nab a lower interest rate or fees from a new lender. Mortgage interest rates are still at historic lows, but they have risen in the last year. You might think that it no longer makes sense to refinance. That's not necessarily true. It all depends on where your current interest rate stands. If the interest rate on your 30-year, fixed-rate loan is 5 percent and you can refinance to a new loan with a rate of 4 percent, you will save money each month. Sure, you would have saved even more had you refinanced earlier, when you might have nabbed an interest rate of 3.5 percent. But if you can still drop your rate by a full percentage point, you will still save a significant amount of money in a refinance. There are also other reasons to refinance besides chopping your monthly payment. You might consider refinancing to a mortgage with a shorter term. By refinancing from, say, a 30-year, fixed-rate loan to a 15-year, fixed-rate loan, you can reduce the amount of interest you pay over the life of your loan by $100,000 or more, if you hold onto your loan for its entire term. Your monthly mortgage payment will go up because you are paying your loan back at a faster rate, but your interest rate, and the interest you pay in total, will fall.